Brett Helquist is best known for his illustrations for the popular A Series of Unfortunate Events children’s books by “Lemony Snicket” (Daniel Handler). Helquist was born in Arizona, grew up in Utah, where he earned a bachelor’s degree in fine arts from Brigham Young University, and currently lives and works in New York City. He cites as his inspiration some of the all time great American illustrators like Howard Pyle, N.C. Wyeth and Dean Cornwell (also here). Helquist’s first job was as an intern for illustrator Robert Neubecker, he then went on to do editorial illustrations for newspapers and magazines. 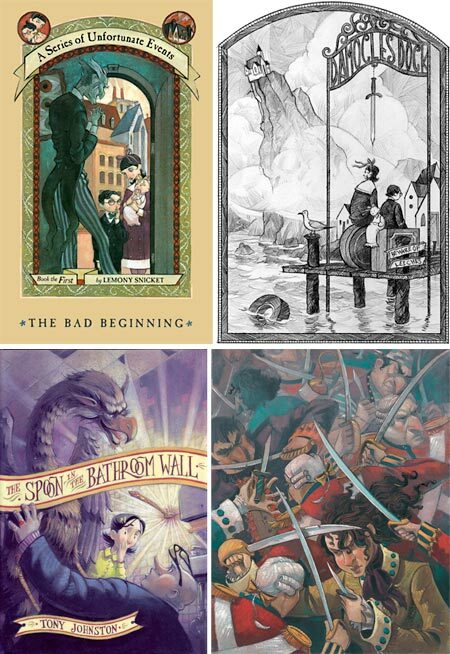 Lemony Snicket’s The Bad Beginning, the first in the series, was his first book illustration assignment. In addition, Helquist is both the author and illustrator of Roger, the Jolly Pirate (above, bottom, right). Joseph Zbukvic is a Croation born artist living and working in Melbourne, Australia. 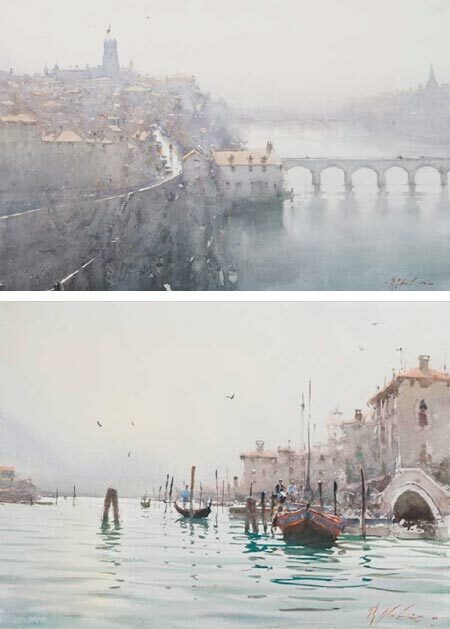 Zbukvic’s atmospheric, emotionally resonant watercolors have a wonderful characteristic of being simultaneously loose and crisp — loose in that he suggests rather than elaborating, and crisp because of his masterful command of edges. He has a highly refined sense of when to define a sharp edge, and when to let an edge disappear into mists of hazy textured color. His landscapes and cityscapes, often of locations in Europe, are highly evocative of the place, without being rigid in their portrayal of details and specifics. He portrays the kind of visual image we might call up as a memory of a fondly remembered place, both hazy and sharp. Many of Zbukvic’s paintings are done on location. His palette is often muted and understated, though sometimes punctuated with higher chroma passages. Zbukvick enjoys dwelling on misty atmosphere, rain and overcast shadow, as well as the haze of bright sunlight. Zbukvick gives highly regarded workshops. This year’s schedule includes dates in France, Spain and Canada as well as Australia. His DVD, Watercolor Impressions, includes scenes from previous workshops; you can see a short excerpt by clicking on the second image on the workshop page. 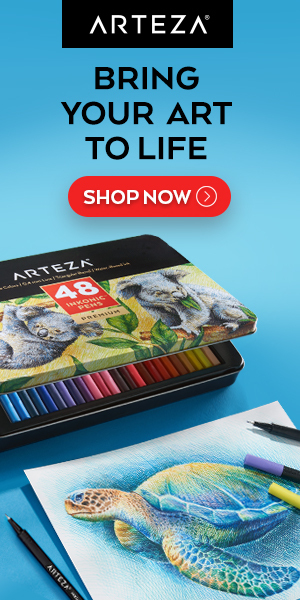 I also came across this video clip from Inside Joseph Zbukvic’s Sketchbook, related I think to a June, 2008 cover story on him in Watercolor Artist magazine. In addition to his workshops, Zbukvick also teaches at Charles Sturt University and the Mitchell School of Arts. Some of the galleries that represent his work have additional galleries in which you will find images not on his site (and/or larger reproductions, particularly the first two listed). Addendum: Adebanji Alade wrote to let us know about Zbukvic’s book Mastering Atmosphere & Mood in Watercolor: The Critical Ingredients That Turn Paintings into Art. Unfortunately, it is out of print and resellers seem to be asking high prices for it at the moment. Perhaps something to keep an eye out for. Blue and green, or is it? All of my studies of color and color theory have led me to the inexorable conclusion that the single most important rule of color is that the human perception of any color is almost entirely dependent on adjacent or surrounding colors. While this principle is visible to the trained eye, both in painting and in life, it is never made more clear than in deliberately created optical illusions, like the e-Chalk color perception illusion I wrote about in this post. This image shown here is one of the most striking illustrations of this principle I’ve seen. I came across it in a post by Phil Plait on Bad Astronomy, who indicated the the original is from Akiyoshi Kitaokaâ’s optical illusion website (scroll to the bottom of the page). Anyone with normal color vision will see a series of green and blue spirals. There would be little chance that a casual observer would suggest that the blue and green might be the same color, and yet they are. You can see in the first detail image that the “green” spirals are only crossed by bands of orange, and the “blue” spirals are only crossed by bands of magenta. In the second detail, you can see the Photoshop foreground/background color blocks where I have used the Eyedropper tool to pick one color out of the “green” band, and the other out of the “blue” band. They are identical RGB values, 0, 255, 150. The same color. The color is actually a green leaning toward blue. Richard Wiseman used Photoshop to change all of the values except the green and blue bands to black, and you can see a detail of the result in the bottom image. There is also a simplified version of the illusion here. So the next time you’re looking at a color an think “that’s green” or “that’s blue”, well, maybe it is, maybe it isn’t, depending on the surrounding colors. Trompe l’oeil, French for “trick the eye” is an illusionary art technique with a long history in Western art. The intention is to create an optical illusion, in that the viewer is given the impression that there is a three dimensional object or scene before them, not just a realistic image (see some of my posts relevant to trompe l’oeil, in particular my post on Eric Grohe). California born artist John Pugh paints large scale trompe l’oeil images, usually on the sides of buildings, that reveal impossible, and often amusing, dimensions to an otherwise flat wall. 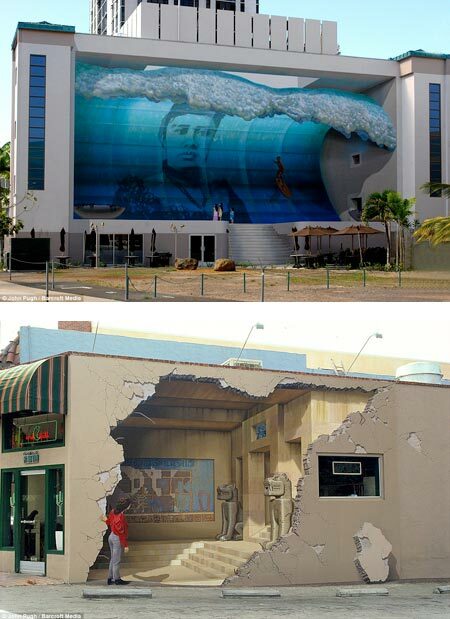 In his Mana Nalu (power of the wave) Mural Project (image above, top, large version here) in Hawaii, the flat side of a building appears to be deeply concave, and filed with an enormous cresting wave, in which we see a personification of Queen Liliâ€™uokalani. Riding the wave is pioneering surfer Duke Kahanamoku, and standing at the foot of the wave, looking for all the world like real children walking on a ledge in front of the oncoming wall of water, are three painted children. Pugh likes to give our sensibilities an extra tease at times by including a painted observer in his illusionary scene. In his Siete Punto Uno in Los Gatos, California (image above, bottom, large version here), a red jacketed woman peers into an apparently earthquake caused break in the wall of a cafe, that reveals a hidden temple of the Mayan Jaguar God (the bringer of earthquakes in their mythology). Pugh’s web site showcases his mural work, public and residential and corporate. It also includes a page of “mural mishap” accounts, in which the illusion of the murals has prompted amusing responses from people, such as patrons in a bar who break glasses trying to set them on trompe l’oeil “shelf”, or people who walk into walls trying to walk “into” his paintings, a la Road Runner cartoons. In addition to his site, Pugh maintains a site for prints and mural posters that also has galleries of images. Spanish painter Juan Gallego paints images that are technically floral paintings, though they are unlike any I have seen. Gallego takes his inspiration in close-ups of flower forms that are convoluted, multi-layered and often have a wrinkled or withered appearance. These are the basis for his large scale compositions (it’s instructive to see a photo of an exhibit to get sense of their size), that border on abstracts. but retain their recognizable forms. He apparently uses photographic reference, and deliberately plays with the illusion of focus in areas of his canvasses, giving them both depth and and compositional structure, demanding that your eye find his intended center of interest. Gallego often provides several detail images to accompany the paintings he posts on his blog, in which you can see the painterly handling of the surface, something that would be hard to see in the smaller images. Also, most of the images in the blog, including the detail images, can be clicked on to see a higher resolution version. He doesn’t seem to update often, but there is enough on the blog to get a good feeling for his work. In the image above, the whole composition at the top shows its painterly characteristics in the detail below it, which is taken from the right hand side of the painting, about a third of the way down. 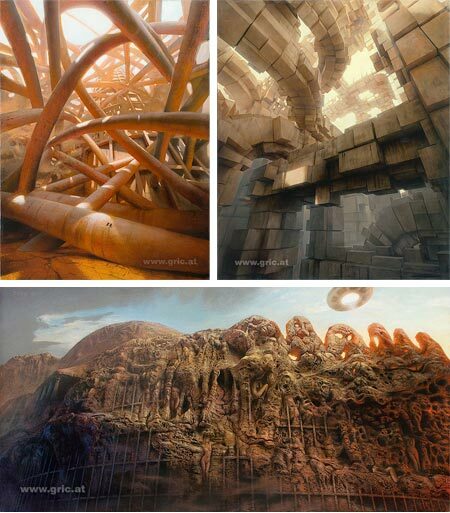 Born in the Czech Republic, Peter Gric emigrated to Austria at the age of 12, and studied at the Academy of Arts in Vienna. His paintings are representational, but they largely depict imaginary objects or landscapes, that can at times seem architectural, at times organic and at other times, a combination of the two. Gric paints in acrylic and sometimes oil, and uses computer graphics and 3D software to help visualize and work out perspective and compositional problems before, or even while painting. His structural imaginings can take curvilinear forms that seem to be obeying some hidden geometry, as if some stone-like material was assembling itself along invisible lines of force. Other images show the apparent dissolution of structures or material formations, with walls or cliffs dissolving into a gravity defying shower of stone blocks. His paintings sometimes include female forms that are apparently made of stone and either dissolving or gathering themselves together from inorganic elements. Gric’s website has his paintings arranged by year, so you can browse back through some of his previous explorations of similar and disparate themes. There is also a shop with prints of images from various times. Gric has also illustrated a number of book covers, largely in the science fiction genre, and you can see some of them in the “Other Projects” section of his site. There is a gallery for Gric’s paintings on the beinArt Surreal Art Collective, which is where I encountered his work, as well as an interview with the artist. He is also featured in the first volume of the Collective’s Metamorphosis collections (see my post on Metamorphosis, Volume I).